La Gloria Cubana | Chicago's Pipe, Cigar & Tobacco Store | Iwan Ries & Co. Inspired by the way La Gloria Cubana cigars were made back in Cuba, today’s La Gloria Cubana cigars were hand crafted in the heart of Little Havana in Miami, Florida in 1968, where their bold taste made them a local favorite among the Cuban-American community. Then, in 1980, to infuse more of its bygone glory and taste, a unique combination of Dominican and Nicaraguan tobaccos were blended to make La Gloria Cubana even more full-flavored and richer tasting. Cigar lovers began to take notice. Then, in 1992, Cigar Aficionado recognized the superiority of La Gloria Cubana, giving it a 90 rating. Today, produced in both Miami and the Dominican Republic, La Gloria Cubana is one of the most sought after cigars in the world. 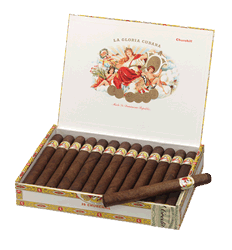 La Gloria Cubana has become a favorite of cigar smokers everywhere. Available in an array of sizes, in both Natural and Maduro varieties, La Gloria Cubana"s special blend of Dominican and Nicaraguan filler and binder become one with its beautifully aged Ecuadoran wrapper to deliver the full, rich flavor that is its trademark. Rich, flavorful and balanced: these words perfectly describe La Gloria Cubana"s taste experience. Once Little Havana’s best kept secret, La Gloria Cubana has become the cigar of choice for cigar smokers the world over who appreciate a richer, fuller-bodied smoke.